Natural gas is the largest source of energy production in the United States. One study places the country’s natural gas production at 25.3 trillion cubic feet of marketed natural gas with an average value of $2.66 dollars per thousand cubic foot for a total wellhead value of $67.3 billion dollars. Now let’s have a look at natural gas prices. 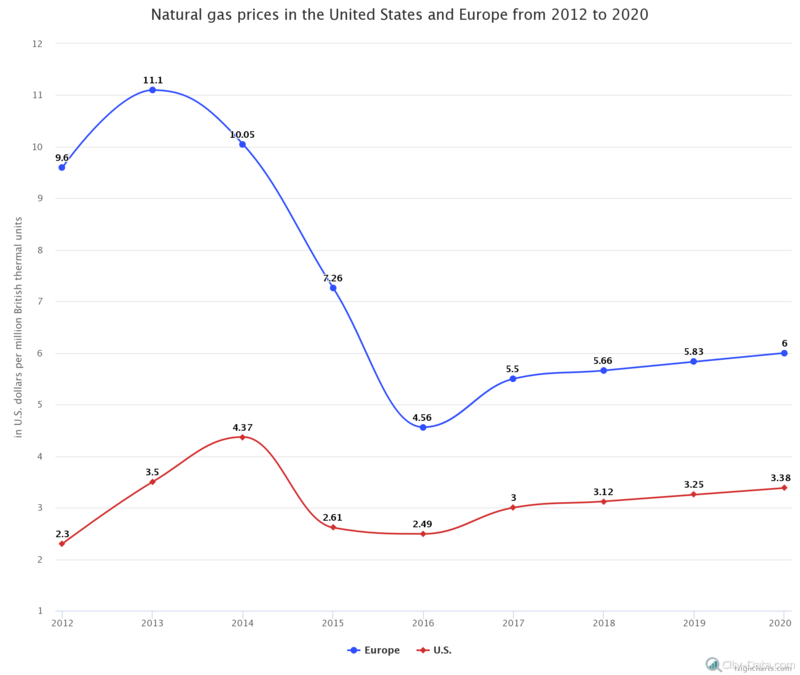 On the graph below, we can see the prices of both U.S. and European natural gas from 2012 to 2018 (including the projections for 2018 and 2019). As you can see, the price of natural gas in the U.S. amounted to $2.30 dollars per million British thermal units (Btu) in 2012. Meanwhile, the price in Europe amounted to $9.6 dollars. In 2013, the price of natural gas in Europe rose to $11.10, while the U.S. saw a price of $3.50. In 2014 and 2015, the price of natural gas amounted to $4.37 and $2.61 per million Btu respectively, while Europe saw prices of $10.05 and $7.26. In 2016, the price of natural gas in Europe dropped to $4.56 per million Btu, while the U.S. saw a smaller change, reaching only $2.49. In the next year, Europe saw natural gas prices of $5.50 per million Btu, while the U.S. price amounted to $3.00 per million Btu. According to the projection, in 2018 and 2019 the prices of gas in the U.S. should reach $3.12 and $3.25 per million Btu. In the same period, European natural gas prices are expected to amount to $5.66 and $5.83. The projection suggests that by the end of 2020 the natural gas price in Europe will reach around $6.00 per million Btu, while the U.S. will see a price of $3.38.